The Finance Minister is apparently delighted that, during the past year, over 40 million passengers made use of public transport. While this represents a seven per cent increase on the previous year, it could have been much more had the government not wasted millions of euros in the improvement of the road network. This money should have instead been channelled towards initiatives encouraging sustainable transport. When the road network is improved, traffic congestion eases temporarily and, as a result, more cars take to the roads. This in turn leads to more traffic congestion – a direct result of government investment. Transport policy-makers have yet to realise that rather than improve the road network, they should increase exponentially initiatives to reduce the number of cars on our roads. It is in this area that major investment is required. The government has decided to make a slow start in this area by announcing two initiatives to encourage group transport in relation to working places. The private sector is being encouraged to provide this through tax credits, whilst government entities employing more than 50 people have been instructed to prepare a sustainable transport plan. This is a belated slow start to addressing traffic congestion, which is related to people going to work using their own transport. The government has opted to use the carrot rather than the stick. Most probably, in the long term there is both the room and the need to use both. A token incentive of free public transport for five thousand 18-year-olds who will reach that age in 2017 will do no harm. It could, however, have been presented in a more innovative manner – linking a longer period of free public transport with bicycle incentives as well as an undertaking from recipients not to seek a driving licence for at least 10 years. Now that would be an investment which would reduce cars from the road in the long term! All initiatives that seek to encourage the use of public transport are worth a try, as they are a step in the right direction. It is, however, necessary that more investment in alternative and sustainable means of transport is forthcoming, primarily in setting up the required basic infrastructure. For example, the infrastructure required to encourage bicycle use is practically non-existent. This needs to be addressed adequately. A first step would be the sustainable transport plans which the Finance Minister is expecting from government entities during 2017. I would expect that, in 12 months time, these plans will start being implemented because government entities should be the first to set an example. Most of our localities are a stone’s throw away from each other and this should make it much easier to encourage a reduction in dependence on the privately-owned car. Initiatives can also be taken on a local level and between neighbouring localities. In such instances, it can be much easier to encourage the use of bicycles. This would require streets where access to cars is prohibited, such access being reserved for bicycle users. In such instances, school children, under supervision, should be encouraged to go to school on bicycles, in bicycle-friendly streets. Initiatives at a local level add up over time and slowly contribute to the formation of a bicycle-friendly society. Even in matters of transport, national problems can be resolved at the town and village level, eventually leading to a solution at a national level. This is a practical way of applying the environmental maxim “think global, act local”. The problem of traffic congestion will not be resolved by the construction of a new generation of flyovers but by equipping our young generations to challenge the status quo. 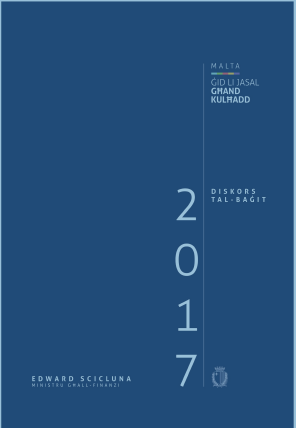 The pre-budget document for 2016 published by the Finance Ministry projects a real GDP increase of 3.2 per cent the year 2016, yet at least half of this projected increase will be wiped out as a result of the impact of traffic congestion in the Maltese Islands. In fact, earlier this year the University of Malta’s Institute for Climate Change and Sustainable Development published an EU funded study entitled The External Costs of Passenger and Commercial Vehicles Use in Malta. This study estimated that 1.7 per cent of our GDP is wasted annually as a result of traffic congestion, a conclusion reached after taking into account both the fuel wasted as well as the time lost. It is in this context that one has to consider the Education Ministry’s White Paper entitled School Opening Hours and Traffic Congestion, published earlier this week. Unfortunately, the Education Ministry had to fill the void created by the Transport Ministry. Traffic congestion is not caused by school transport alone – this is just one of many causes. The solution advocated by the Transport Ministry over the years has been to focus on the effects rather than the causes, with the result of even more space being ceded to cars. It has opened up more roads, widened existing ones and introduced flyovers. These “solutions” have encouraged more cars so that our roads are now bursting at the seams, with 340,981 licensed vehicles on the road at the end of the second quarter of this year. This translates into 802 cars per thousand population, and most probably is the highest vehicle ownership profile in the world. It is even higher than the vehicle ownership profile of the USA (786). Comparing it to other EU countries, the figure for Italy is 682, the UK 516, Spain 592 and Switzerland 573. Even Luxembourg – at 741 per thousand is lower than Malta. Such a large number of cars is not an indication of affluence. It is rather a clear indication of the failure of the state of Malta to realise that the smallness of these islands was an untapped benefit in developing policies that ensure sustainable access. It is clear that, over the years, the state of public transport has been the single biggest incentive to private car ownership and use. Cars have been allowed to fill the void and take over our streets. The cumulative impacts of this take-over has been a reduced access to public spaces in our towns and villages, a general deterioration of air quality and the associated respiratory diseases and accelerated urban decay in such areas as Pietà, Ħamrun, Msida, Paola, Fgura and Marsa. This present state of affairs is the result of a lack of long-term planning. Transport planners in Malta preferred the easy way out: the construction of new roads, tunnels and flyovers engulfing more land as well as the creation of more parking spaces. The resulting impact compounded the problem: In the 25 years since 1990, the number of vehicles on the Maltese Islands roads increased by a staggering 145 per cent. The situation was made worse by the removal of a number of bus termini in a number of localities, the decisions to build a number of schools in the middle of nowhere and having industrial zones not serviced by public transport. In addition, the lack of enforcement of speed limits for vehicles making use of our roads served to squeeze out bicycles and small motorcycles as alternative means of transport. This is the situation which has to be addressed. The long term solution is an efficient public transport system and a corresponding decrease in the number of vehicles on the road. The White Paper published by the Education Ministry is one such exercise, intended to reduce the number of vehicles on the road as a result of ferrying school children to and from schools in their parents’ private cars. Better organisation of school transport, as well as more incentives to encourage its use, is a definite step forward. In addition, the Education Ministry could try to ensure that the catchment areas of its secondary schools are not spread over a very wide area as this is one other contributory factor that has not yet been identified as an additional culprit. The debate, however, has to be much wider than schools, because, at the end of the day, our schools are just victims of the accumulated lack of transport planning.